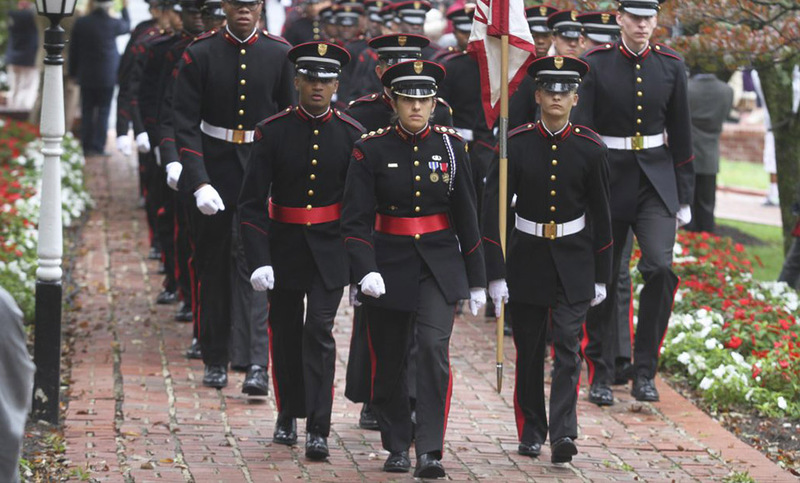 Valley Forge Military College has a long tradition of developing young men and women into people of character, discipline and integrity. Use this tuition net cost estimation calculator to estimate your total year cost of attending Valley Forge Military College. Based on your answers to these questions this calculator will help you estimate your total cost of attending for a year. This estimate takes into account your financial and living situation and uses the most recent EFC formulas and Valley Forge Military College associated rewards. The total tuition(plus room & board, fees, books, and miscellaneous expenses) is then reduced by the amount of your expected financial aid rewards. As you answer these questions, questions that are no longer relevant to you based on previous answers may be removed or added. Information entered into this form is not saved permanently in any way. This calculator uses these EFC formulas for 2018-19 and included tables. By clicking "I Agree" below you are acknowledging that you have read and understood that the results of this calculator are an estimate only. This is not a binding agreement between any state or federal organization and is simply an estimate. Please answer the following questions. Your answers will be used to estimate the total yearly cost of attendance at Valley Forge Military College. This will only be an estimate. To find out how much Federal Student aid you may qualify for visit StudentAid.ed.gov. Already know your EFC number? Your parents' other dependent children. To qualify for federal student aid, certain eligible non-citizens must be able to provide evidence from the USCIS that they are in the United States for other than a temporary purpose with the intention of becoming a U.S. citizen or permanent resident. Review the information you have provided. You can click the Edit button below to return to the beginning and edit provided information or if you are happy with the current selections click "Total" to view your estimated net price. Questions may appear or disappear depending on answers to previous questions. Where the student will live while attending this institution. * Based on the answers given you are an independent student. * Based on the answers given you are an dependent student. * Based on the answers given your not a citizen of the U.S or not U.S. eligible non-citizen and do not qualify for federal assistance. Estimated total cost of attendance per year. Includes both merit and need based grant and scholarship aid from Federal, State, or Local Governments, or the Institution. * This institution requires that full-time, first-time students live on-campus or in institutionally controlled housing. * These estimates are for full-time undergraduate students. * As a non-citizen none qualified alien. Your are not eligible for assistance. This is only an estimate. To apply for federal aid and to find out your official available aid visit FAFSA AID and complete the application.